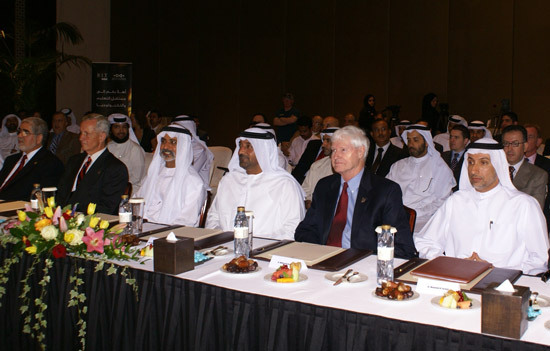 From left to right, Mustafa Abushagur, RIT professor and director of microsystems engineering; Mike Morley, chairman of the RIT board of trustees; His Highness Sheikh Nahyan bin Mubarak Al Nahyan, minister for higher education and scientific research; His Highness Sheikh Ahmed bin Saeed Al Maktoum, chairman of Dubai Silicon Oasis Authority; Bill Destler, RIT president; Mohammed Al Zarouni, vice chairman and CEO of Dubai Silicon Oasis Authority. A delegation from Rochester Institute of Technology, led by President Bill Destler, today signed an agreement with several high-ranking officials from Dubai and the royal family to open a new campus in the booming Middle East city. RIT Dubai, the name of the new campus, will be a part of Dubai Silicon Oasis, a 7.2-square-kilometer complex that will include a high-tech park, housing, retail, banks, conference centers and more. Dubai Silicon Oasis is being called the “world’s premier high-technology park for microelectronics and semiconductor research, development and production” by Dubai officials. RIT Dubai will be in the heart of the multi-billion dollar complex created by the Dubai government. Dubai will invest in building a full-fledged campus including academic center, living quarters for students and faculty, and recreational facility. RIT will provide academic content, leadership and management of the university. Dubai is one of the seven Emirates and a major port on the Persian Gulf. Dubai is feverishly transforming into an international hub of commerce in the Middle East. Dubai leaders are also focusing on strengthening higher education in the region. The ruler of Dubai, Sheikh Mohammed Al-Maktoum, has established a $10 billion foundation to support human development in the Arab world. A major focus of this foundation is to provide scholarships to enhance higher education in the region. Dubai officials at the ceremony included H.H Sheikh Ahmed bin Saeed Al Maktoum, chairman of Dubai Silicon Oasis Authority; His Highness Sheikh Nahyan bin Mubarak Al Nahyan, minister for higher education and scientific research; Mohammed Al Zarouni, vice chairman and CEO of Dubai Silicon Oasis Authority and several other high-ranking officials from Dubai Silicon Oasis Authority. In September, initial offerings at RIT Dubai will focus on part-time graduate students in fields such as: electrical engineering, mechanical engineering, finance, human resource development, networking and systems administration and service leadership and innovation. By 2009, graduate offerings will extend to full-time graduate students and include, telecommunications, facility management, industrial engineering and manufacturing management and leadership. In 2010, RIT Dubai will begin offering undergraduate programs to full-time students. RIT Dubai will be attracting students from the Middle East, Southeast Asia and Africa. RIT Dubai will be led by Professor Mustafa Abushagur. The partnership will create unique study and co-op abroad opportunities for RIT students. RIT expects the establishment of RIT Dubai to create significant opportunities for faculty exchange as well. For a photo of the signing ceremony, contact Bob Finnerty at bob.finnerty@rit.edu.